Locating fish during the winter months can be tougher than it is during the spring or summer. It’s hard to tell where the bank is located. You have no idea what’s under the ice or the conditions of the water. Here are four tactics that will dramatically improve your ability to find fish through the ice. As it is during the open-water season, structure is one of the most important factors for finding fish in the winter. Of course, locating structure is often a greater challenge in the winter, because it is more difficult to visually identify some forms of structure. One of the best ways to identify structure is to purchase a quality map of the lake you plan to fish. A good map will identify drop offs, sandbars and even rock piles, which can help you pinpoint the best areas to fish. In general, it is best to focus your efforts on weedlines, points and sand bars early in the ice fishing season. As the season progresses, fish tend to move to deeper water in search of food and higher oxygen levels, so you should concentrate more on deep rock piles or humps. Late in the season, fish will move again, this time to shallow areas, as they prepare for the spawn. 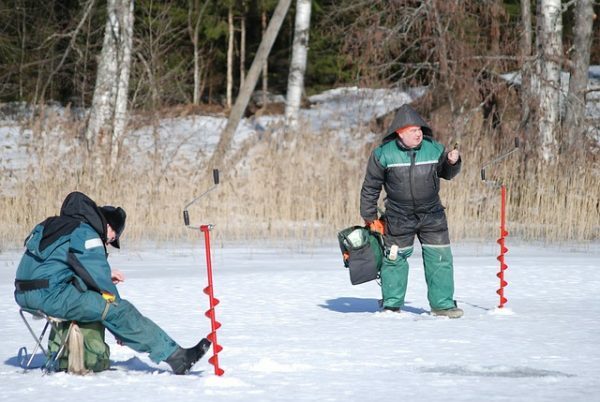 There are some general rules to follow when trying to locate fish during the winter. For the most part, yellow perch and walleyes will be at or near the bottom. Keep your baits within a foot of the bottom. Even try bouncing your baits right off the bottom. Panfish, such as sunfish and crappies are typically suspended during the winter. Their exact depth will depend on what types of foods they are finding. Your best strategy is to use a fish finder to best identify the depth at which the fish are located. If you do not have a fish finder, vary the depth at which you are fishing, until you locate the fish. Northern pike are likely to be suspended early and late in the season, when they are in shallow water. When they are in deeper water, look for them near the bottom. Stream trout in lakes tend to cruise the lake in search of food and can be among the toughest fish to locate during the winter months. One day they may be near the bottom and another they may be right under the ice. A fish finder is especially useful in locating trout. One mistake many ice anglers make is staying in one place too long. Moving all your gear and drilling new holes is a lot of work, but if you are not finding fish at your location, you need to move. Keep moving until you find fish. Traveling light and remaining mobile will make frequent moves much easier. When you find and area of structure that appears promising, drill holes at various depths so you can better locate the fish. For example, if you are fishing a point, drill holes at 10, 15 and 20 feet. Try one depth and move to the next if you are not finding fish. This is a quick, efficient way of covering an area thoroughly before moving to a new location.